This past weekend, GC alumni made their way back to campus. A select four of these alumni were honored for the work they’ve accomplished since they walked across the stage at their own graduations. 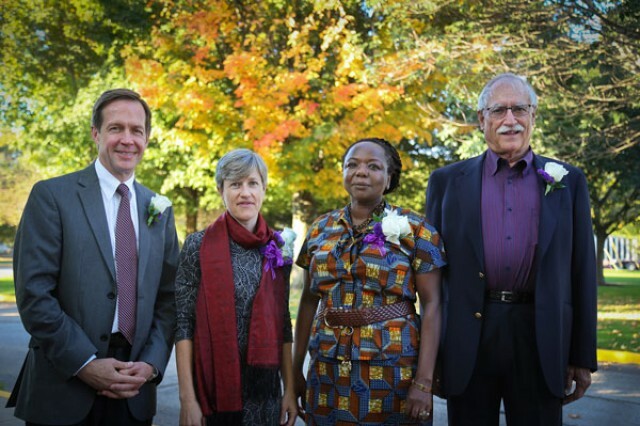 Ellah Wakatama Allfrey ’88 of London, England, as well as Dr. Doug Schwartzentruber ’78, of Indianapolis received the 2016 Culture for Service Awards. Aletha Stahl, ’89 of Richmond, Indiana received the Dr. Ruth Gunden Champion of Character Award. Meanwhile, James Gingerich ’66 of Albuquerque, New Mexico received the Dr. Roman Gingerich Champion of Character Award. Each of these four awards were presented on Friday morning at College Mennonite Church during a convocation, where Allfrey also gave a brief speech after receiving her award. Sponsored by the Goshen College Alumni Board, the Culture for Service Awards began in 1989 and are given each year to GC graduates that have made lifelong commitments to service. Allfrey, who is internationally known for her work as an author, literary critic, editor and broadcaster, grew up in Zimbabwe, but currently lives in London. This fall, she is spending the semester back in Goshen teaching two classes for GC students. During her time leading up to this past weekend, Allfrey had the opportunity to wander around campus and the city of Goshen. Schwartzentruber is best known for being named one of TIME Magazine’s 100 most influential people in the world in 2010 for his innovate research on the role vaccines play when treating skin cancer. As a surgical oncologist and the system medical director for Indiana University Health’s statewide cancer services in Indianapolis, much of his work is known for being very patient-care centered. This year was the tenth anniversary of the Dr. Ruth Gunden and Dr. Roman Gingerich Champions of Character Awards. Both Gingerich and Stahl later spoke at a reception for their awards on Saturday in the Recreational Fitness Center. Stahl, who is a professor of French and francophone studies at Earlham College, was the founding member of GC’s first full-season women’s cross country team. Stahl added how receiving the award served as reminder of the importance of co-curricular activities as part of a holistic education, acknowledging the ongoing inspiration she received from her peers and teammates. Gingerich, who has a diverse resume, participated in both basketball and baseball at GC and served in agricultural economic development for 34 years. The award he received was named for his father.